FORT PIERCE, FL. 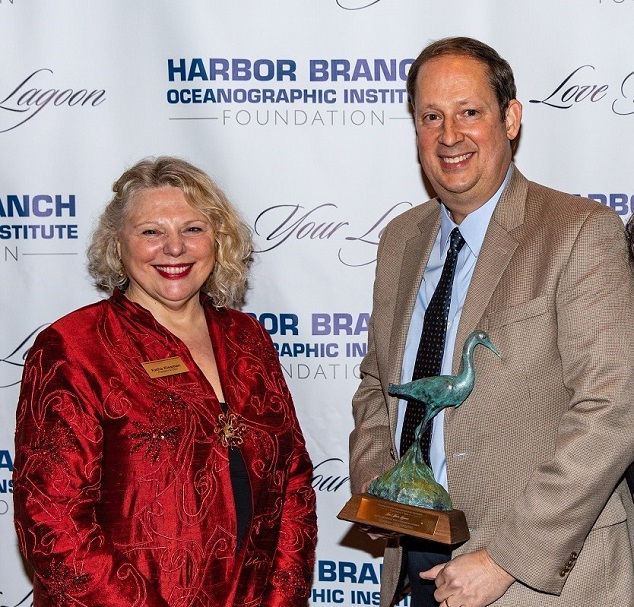 (February 5, 2019) Once again, the work of local graduate students conducting research on the Indian River Lagoon will continue, thanks to proceeds from the Harbor Branch Oceanographic Institute Foundation’s (HBOIF) highly successful “Love Your Lagoon” event. 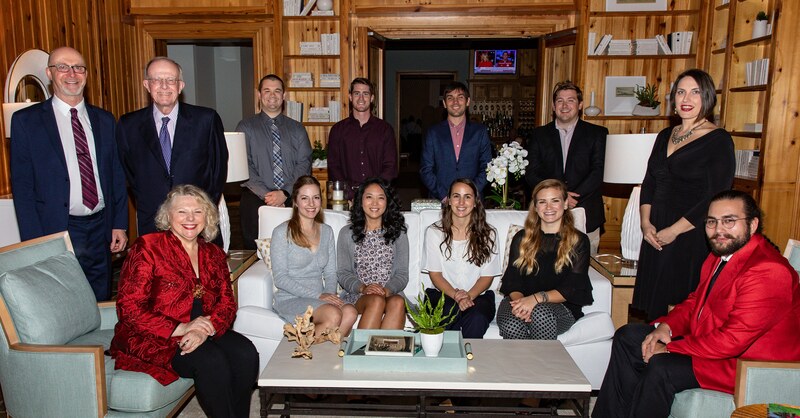 The eight annual sold-out event recently took place at the Quail Valley River Club, raising critical funding to benefit research and outreach on the Indian River Lagoon by the Harbor Branch Oceanographic Institute at FAU (HBOI). Proceeds from the event will fund the 2019 Indian River Lagoon Graduate Research Fellows program, supporting the work of graduate students involved in direct Indian River Lagoon research at HBOI. Each student will be mentored by an HBOI Faculty Member at the HBOI campus. The competitive process will result in support for salary, tuition, travel to present research, and/or necessary materials. Fellows will ultimately present their research at the 2020 Indian River Lagoon Symposium as well as the FAU Charles E. Schmidt College of Science Graduate Research Day. In addition, proceeds from this year’s event will support the 2010 Indian River Lagoon Symposium: Quo Vadis. The Indian River Lagoon Symposium is a multi-institutional, multi-agency effort to provide a forum for discussing Indian River Lagoon science and its application to management of the lagoon. To be held February 7 and 8, 2019 at HBOI, the Symposium is attended by more than 600 over the course of two days. Traditionally, HBOIF has named an honoree at each of its previous events. The 2019 Leadership and Achievement Award Honoree was former Senate President Joe Negron. Senator Negron’s greatest local accomplishment was SB 10, which secured funding and set deadlines to build a reservoir to reduce Lake Okeechobee discharges to coastal estuaries. It was approved in 2017, the year after toxic algae closed the St. Lucie River, Indian River Lagoon and — for the first time — Atlantic beaches. In addition, Senator Negron fought for the Florida Forever environmental land-buying program and beach re-nourishment, which is expected to receive additional funding this year as part of the state budget. Past honorees have included the Florida environmental pioneer, Nathaniel Reed, in 2012; The late, great land and lagoon protector, Alto “Bud” Adams, Jr. in 2013; Vero’s First Lady, Alma Lee Loy, in 2014; lagoon advocate, Florida Oceanographic Society’s Mark Perry, in 2015; the Smithsonian’s early lagoon champion Dr. Mary Rice, in 2016; the woman who coined the name “Indian River Lagoon” as well as so much more, Diane Barile, in 2017; and for 2018 the Principal Investigators proudly funded by HBOIF: Matt Ajemian, Ph.D., Assistant Research Professor; Steve Burton, M.S., Marine Mammal Stranding Manager; Laurent Chérubin, Ph.D., Associate Research Professor; Fraser Dalgleish, Ph.D., Associate Research Professor; Nick Dickens, Ph.D., Associate Research Professor; Esther Guzmán, Ph.D., Associate Research Professor; Dennis Hanisak, Ph.D., Research Professor & Director of Marine Ecosystem Health Research; Mingshun Jiang, Ph.D., Associate Research Professor; Brian Lapointe, Ph.D., Research Professor; Susan Laramore, Ph.D., Associate Research Professor; Marilyn Mazzoil, B.S., Research Associate; Peter McCarthy, Ph.D., Research Professor & Associate Director for Education; Greg O’Corry-Crowe, Ph.D., Research Professor; Bing Ouyang, Ph.D., Assistant Research Professor; Annie Page-Karjian, DVM, Ph.D., Assistant Research Professor/Clinical Veterinarian; Shirley Pomponi, Ph.D., Research Professor & Executive Director, NOAA Cooperative Institute for Ocean Exploration, Research & Technology; John Reed, M.Sc., Research Professor; Marty Riche, Ph.D., Research Professor; Adam Schaefer, M.P.H., Research Coordinator & Epidemiologist; Jim Sullivan, Ph.D., Research Professor; Michael Twardowski, Ph.D., Research Professor; Joshua Voss, Ph.D., Assistant Research Professor; Anni Vuorenkoski Dalgleish, Ph.D., Assistant Research Professor; Guojun Wang, Ph.D., Assistant Research Professor; Paul Wills, Ph.D., Research Professor & Associate Director for Research; and Amy Wright, Ph.D., Research Professor. Their collective and collaborative research and activities have contributed to a healthier Indian River Lagoon for us all. Sponsors for this year’s “Love Your Lagoon” included: Mangrove Sponsors: Mr. Joseph Z. Duke, III and Mrs. Jennifer Johnson Duke; Mr. Michael O’Reilly and Mrs. Marie O’Reilly. Seagrass Sponsors: Parker; Ms. Marjorie Raines and Mr. Harold Baker; Dolphin Sponsors: Evans Properties, Inc.; John C. and Marilyn McConnell, Jr.; William J. Stewart, Esq. and Mrs. Laurie Kaneb Stewart and the Law Firm of Rossway Swan Tierney Barry Lacey & Oliver, P.L. ; Mr. Michael Toner and Mrs. Carol Toner. Manatee Sponsors: AT&T; Mr. Michael Brown, Sr. and Mrs. Mimi Brown; Florida Power & Light; Mr. Michael Minton and Mrs. Misty Minton and the Law Firm of Dean, Mead, Minton & Zwemer; Mr. Ed Michelson and The Atlanta Consulting Group; Wells Fargo. Seahorse Sponsors: Adams Ranch; Mr. C. Amos Bussmann and Sea Technology Magazine; DZ Advertising; Dr. Joseph Ferro and Mrs. Olivia Ferro; Ms. Katha Kissman; Kmetz, Elwell, Graham & Associates, PLLC; Dr. Ed Lippisch and Mrs. Jacqui Thurlow-Lippisch; Martin Community Foundation; Martin Health Systems; Metz, Husband & Daughton, P.A. ; The Mikita Foundation; Oceans, Reefs & Aquariums – ORA; Mr. John Papa and Mrs. Barbara Papa; Dale Sorensen Real Estate; Ms. Isabelle Tapley; Vero Insurance; Windsor; Wyland. Mark your calendars now for the ninth annual “Love Your Lagoon” Gala, which is tentatively set for Friday, Feb. 7, 2020. For more information on next year’s event, call 772-466-9876 ext. 200 or visit www.hboifoundation.org.